On May 1, Wiki Loves Earth starts its sixth year of crowdsourcing photos of natural monuments and provides a chance to win local and international prizes. It has grown to become a truly global and large-scale photo contest, helping attract half a million free photos of natural monuments and protected areas from more than 50 countries. Wiki Loves Earth is a photo competition which calls for participants to picture nature protected areas and upload their photos to Wikimedia Commons. Photos are uploaded under a free license that enables their free worldwide use on Wikipedia, other Wikimedia projects, and any other project. The previous five contests gathered more than 500,000 photos, and we hope that Wiki Loves Earth 2019 will show even better results. Wiki Loves Earth is organised through numerous national contests coordinated by local volunteers around the globe. By now 23 countries are on the participating countries list, and we expect more local teams to join. Participants of the contest will compete for international prizes; local teams might also offer their awards. To participate in the contest, sign up on Wikimedia Commons, find an item or place you are familiar with from the competition list, and upload them to Commons. You can check whether your country participates in Wiki Loves Earth this year and find more information about it on the Wikimedia Commons page. Rules of the contest are also available on Commons. If you would like to organize a local contest in your country, contact us at wle-team@wikimedia.org.ua. For questions, please contact wle-team@wikimedia.org.ua. Author Anton ProtsiukPosted on April 15, 2019 April 17, 2019 Categories AnnouncesLeave a comment on Join Wiki Loves Earth 2019! First place: The limestone of Stopića Cave, Serbia. Photo by Cedomir Zarkovic, CC BY-SA 4.0. The tangy butterscotch glow of a limestone cave in Serbia soaking up the slanting sun. The emerald green of lush German forest and pond covered with lush weeds and trees. The stark white and blue of a Ukraine snowscape 2,028 meters above sea level, where snowy peaks meet cloud and sky. The colors of nature burst from the 15 finalists of Wiki Loves Earth, the photo contest now in its third year of crowdsourcing gorgeous landscapes from more than 13,600 participants. The top 15 photos this year come from Serbia, Bulgaria, Nepal, Estonia, Ukraine, Spain, Austria, Brazil, Germany, and Thailand. National judging in 26 regions sorted through 115,000 photos and sent the best to international judges from Ghana, Germany, South Africa, Kosovo, France, India, Estonia, Indonesia, and Bulgaria. This year, the contest expanded to include a collaboration with the United Nations Educational, Scientific and Cultural Organization, better known by its acronym UNESCO. Contestants were invited to upload photos in a separate category for UNESCO biosphere reserves in 120 different countries. You can see more about Wiki Loves Earth on its website, and this year’s jury report on Commons. Second place: Pobiti Kamani, Bulgaria, the only desert in Eastern Europe. Photo by Diego Delso, CC BY-SA 4.0. Third place: Tangye, Mustang, Nepal. Photo by Patricia Sauer, CC BY-SA 4.0. Fourth place: Ahja River, Estonia. Photo by Külli Kolina, CC BY-SA 4.0. Fifth place: Biały Słoń, the former Polish Astronomical and Meteorological Observatory, now located in Ukraine. Photo by Khoroshkov, CC BY-SA 4.0. Sixth place: Northern Inland Fuerteventura, Spain. Photo by Tamara Kulikova, CC BY-SA 4.0. Seventh place: Vääna River, Estonia. Photo by Kristoffer Vaikla, CC BY-SA 4.0. Eight place: Part of the Schladming Tauern. Photo by Jörg Braukmann, CC BY-SA 4.0. Ninth place: Tokivske waterfall in Ukraine. Photo by Ryzhkov Sergey, CC BY-SA 4.0. Tenth place: Lençóis Maranhenses National Park, Brazil. Photo by Joao lara mesquita, CC BY-SA 4.0. Eleventh place: the same location as #5, but taken on a cold winter day. Photo by Taras Dut., CC BY-SA 4.0. Twelfth place: Wettenberger Ried, a protected forest in Germany. Photo by Andreas Weith, CC BY-SA 4.0. Thirteenth place: Khao Sam Roi Yot National Park in Thailand. Photo by KOSIN SUKHUM, CC BY-SA 4.0. Fourteenth place: Terra Ronca State Park, Brazil. Photo by Rafael Rodrigues Camargo, CC BY-SA 4.0. Fifteenth place: Tara in Serbia. Photo by Vladimir Mijailović, CC BY-SA 4.0. Originally published on the Wikimedia blog at https://blog.wikimedia.org/2016/11/25/wiki-loves-earth-2016-winners/. This year, “Wikimedians of Bulgaria” User Group participates for the second time with a local edition of the photo contest for environmentally protected territories, “Wiki Loves Earth 2016 Bulgaria“. And one of the ten winners in the national stage of the competition will be printed as an official postage stamp of the Republic of Bulgaria. This is the additional ‘surprise’ award, which the organizing team of the competition in 2016 arranged along with the planned prizes – vouchers for photographic equipment shops or bookshops, that will be provided under a project funded by the Wikimedia Foundation. Which one of the ten photos would illustrate the postage stamp, was a decision taken by the members of the Committee of Postage Issuance under the Ministry of Transport, Communications and Information Technologies. And this choice has already been made. It is the 2nd-ranked photography in Top 10, by Emiliya Toncheva, which depicts a griffon vulture in the Valchi Dol Reserve near the small town of Madzharovo in Eastern Rhodopes, Bulgaria. Notably, Emiliya was the first volunteer to contribute her photos to the “Wiki Loves Earth 2016 Bulgaria” in the very first day of the contest, June, 1. The Committee approved the young illustrator Dilyana Elshishka for designer of the postage stamp, and determined the nominal of BGN 2 (approx. EUR 1), which is the price for sending a postcard from Bulgaria to United States, for example. This stamp will be in valid use and circulation for the next three years. The attempt is to have the stamp ready around October, 1 when the local WLE organizing team is conducting the award ceremony in the National Museum of Natural History in Sofia. 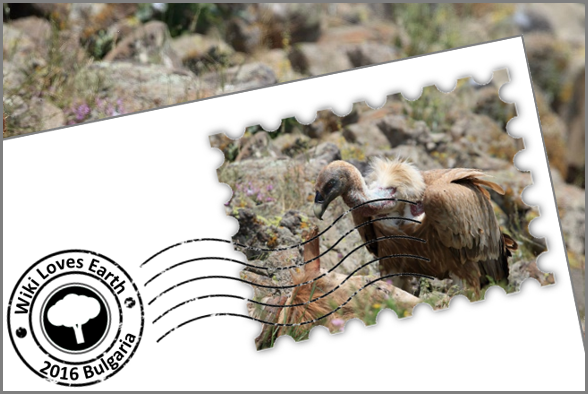 The photograph selected by the Committee of Postage Stamp Issuance is special because it will stay on the very first Wikimedia-related postage stamp in Bulgaria, which also is the first one for the “Wiki Loves Earth” contest globally. The photo is noteworthy also for touching one of the most important topics of Bulgarian environmental protection: protection of the birds of prey. In Bulgaria, all the three nesting or feeding vulture species – Griffon vulture (Gyps fulvus), Egyptian vulture (Neophron percnopterus) and Cinereous vulture (Aegypius monachus) are rare and protected species, and the Bearded vulture (Gypaetus barbatus) has been since 2007 in a re-introduction program, because of being extinct from the territory of Bulgaria. And while the griffon vulture’s population can nowadays be considered stabilized, the Egyptian vulture continues to be the most rapidly declining among all birds of prey in Europe, with more than 80% decreased population in the Balkans for the last 30 years. Poisons intended to kill agricultural pests are the main reason for the extinction of vultures, whose ecologic role is the one of the natural sanitarians of wildlife. Wiki Loves Earth will continue in Morocco until June 7 ! Initially planned until May 31, the organizing committee of photography contest Wiki Loves Earth in Morocco, namely Wikimedia Morocco, announced that he decided to extend the duration of the contest for another week, so he closed the June 7. Given the large number of participants continues to grow and multiplying in a processive way uploaded photos. Continue to add your photos to this link ! Prévue initialement jusqu’au 31 mai, le comité d’organisation du concours de photographie Wiki Loves Earth au Maroc, à savoir Wikimedia Morocco, a annoncé qu’il a décidé exceptionnellement de prolonger la durée du concours pour une autre semaine, ainsi il se clôtura le 7 juin prochain. Vu le grand nombre de participants qui ne cesse d’augmenter multipliant ainsi de manière processive les photos téléversées. Continuez à ajouter vos photos via ce lien ! Author Reda BenkhadraPosted on June 2, 2016 Format ImageCategories Announces, NewsTags Morocco, Wiki Loves EarthLeave a comment on Wiki Loves Earth will continue in Morocco until June 7 ! During 2015, over 100,000 pictures were submitted by the participants. The full report of the international jury, explaining the work of the jury, selection process and presenting the results together with comments of the jury, is available here. Congratulations to the winners and thank you for everyone who worked on organisation of the contest this year! All photographs in this post are published by their authors under CC BY-SA. Click the photos for details. Germany announced their national winners. This year contestants uploaded a lot of photos of wild life, so no wonder, that we have them among the winning images. Germany is the 3rd country which choose their top-10 best photos. Take a look! The common kingfisher (Alcedo atthis) also known as Eurasian kingfisher, or river kingfisher, is a small kingfisher with seven subspecies recognized within its wide distribution across Eurasia and North Africa. It is resident in much of its range, but migratesfrom areas where rivers freeze in winter. WLE 2015: who is on the run? “Wiki Loves Earth 2015 ” closed on 31 May at 0:00:00 Kyiv time with 97 342 photos uploaded from 1-31 May. This year competition broke down the record of the WLE 2014. The contest is closed in 19 of 26 participating countries. Some countries decidede to prolonged the contest: Algeria, Austria, Nepal, Thailand – till 30 June, Tunisia – till 15 June. Author Ievgen VoropaiPosted on June 2, 2015 February 17, 2016 Categories Announces2 Comments on WLE 2015: who is on the run? Wiki Loves Earth 2015 is coming soon! On 1st May 2015 the Wikimedia community with the help of its Ukrainian and Polish Chapters and volunteers is starting an international photo contest with a natural heritage theme, Wiki Loves Earth 2015. This is the third year of the competition. In 2013, Ukraine was the only participant, last year there were 16 countries in the contest and now it encompasses Algeria, Andorra and Catalan areas, Austria, Azerbaijan, Brazil, Estonia, France, Germany, Macedonia, Nepal, Pakistan, Poland, Portugal, Russia, Spain, Syria, Tunisia, Uruguay, Ukraine and many more are willing to join in to share their natural monuments with the world! Wiki Loves Earth is organized through numerous national contests, coordinated by local volunteers. The national juries then submit up to 10 pictures to the international stage of the contest. Last year with 16 participating countries, the international jury had to consider a total of 156 candidate pictures! This photo contest is not only a great opportunity to show the charms of nature, but also a chance to draw public attention to environmental problems and Wikipedian activities. The focus is not only on sites of national importance, but also on the areas protected on the regional level and on the widest variety of natural sites possible: forests, parks, gardens, rocks, caves and whatever is protected within the participating countries. This means that most users will be able to find several natural heritage sites close to them. We truly hope that you will participate in our joint efforts to make this year’s contest even brighter! All photographs in this post are published by their authors. Click the photos for details. Author Mykyta KovalPosted on April 15, 2015 February 17, 2016 Categories AnnouncesLeave a comment on Wiki Loves Earth 2015 is coming soon!